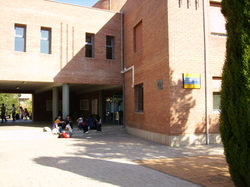 The secondary school IES. José Rodrigo Botet is situated in an industrial area of Manises, 7 km to Valencia, in the Mediterranean Spain. The school have about 500 students and 60 teachers; there are secondary school , training courses and the adult education. José Rodrigo Botet was a biologist of XIX century, born in Manises and he collected a lot of archaeological pieces, skeleton of prehistoric animals....now this collection is in the local Natural History Museum.